Since having a wisdom tooth out on Tuesday I've been laying low this week and took the opportunity to construct a kit. Shown at right during construction, the MMR-40 from Hendricks QRP kits is a great little kit transceiver. Mine was missing a couple of diodes but was otherwise complete. I had a few problems getting the receiver going due to the fact that I hadn't read the errata and mistook the different zener diode for one of the missing diodes and experienced some very strange voltages that affected the transmit/receive switching circuit. After a long night of hair pulling I joined the Yahoo MMR40 owners group and posted a question about my symptoms. Very quickly Tom replied from a Blackberry with a pointer to the problem. Great stuff. I find building kits is a great way to get familiar with components and in particular diagnosing problems helps me greatly in understanding the circuit. 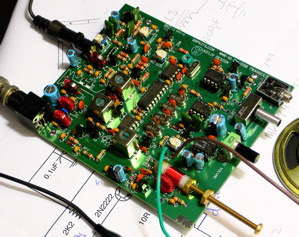 I never dreamed that I could build an SSB transmitter. Still some work to do to get it all lined up but it seems to be putting out a few watts. An interesting part of this design is the permeability tuned oscillator where part of the inductance is varied by screwing a brass bolt in and out of the coil. You can see it at the bottom right of the image above. Counter-intuitively, to me, is that frequency goes down as you wind the bolt in. The good thing is that you get slow change over turns of the knob and it seems remarkably unaffected by hand capacitance. Update: After swapping out the mis-placed zener the receiver was still a little disappointing. Turned out that like others I had followed the layout diagram and installed a 22pF capacitor at C18 which caused T1 not to tune up. The only other oddity is that if I turn my variable supply up much above 12V the receiver mutes, not a big deal. Anyhow, the receiver is working really nicely and is sensitive enough to hear all that bad band noise on 40m, which is all you need really. I'm not confident that my transmitted SSB is right yet, it puts out power when I talk but doesn't look like real SSB just yet. A simple modification has been to install a stereo headphone jack that cuts off the speaker. Builders should note that the speaker really comes to life when you put it in the box and close it, very soft on the bench on its own. I'm enjoying this but I think the kit errata needs an update. The design is very clever in that it re-uses lots of components for both receive and transmit but it lacks a block diagram so I've tried to create my own here. (Click for a larger version). Please send me corrections! Incidentally, wisdom tooth removal went very well - the wonders of modern dentistry. My most recent project is the MMR-40 rig by Steve, Kd1JV. Anyway, I came across your block diagram some time ago, and had it stored away. I'd like to ask your permission to use your diagram on my blog, as I describe the various stages to relative newcomers to ham radio. I have to confess that I've already used it in a couple of posts, but since I would like to use it more than incidentally, I thought I should ask your permission. Nice blog, I love that you're using spice to model the circuits - must get in to that myself. Love your about page with all the old gear. No problem using the block diagram. If you notice anything I've got wrong please let me know.